I’m interested in seeing which Eagles team shows up grr or more seriously. Do the Eagles have players coming back into the league this week . Good question Admin have told me its fine to post the teams. B no family emergencies this week the ER isn’t great . And it wasn’t me this time . Guilhaus and N. Hayes trained with reserves, I would think N. Hayes does not play at all and Seb. plays in the reserves. Pickett and Mead selected in Aust. U18 team to play Casey on Saturday, so they will miss the match on Friday. Toumpas, Lonergan, Sinor and Giuffreda trained in the league squad of 23. West was also in the squad of 23. Feathers wrote: Guilhaus and N. Hayes trained with reserves, I would think N. Hayes does not play at all and Seb. plays in the reserves. If big Seb is available he should play. Last game was NT GF. It appears a handy lot of injured players to come back. JT needs a run in the 2's. I would rather have an under done Jimmy T. in the team than a few others. Seb might be paying a club penalty!!!!! Feathers wrote: I would rather have an under done Jimmy T. in the team than a few others. Woodville-West Torrens will welcome back a favourite son for the Good Friday clash with West. 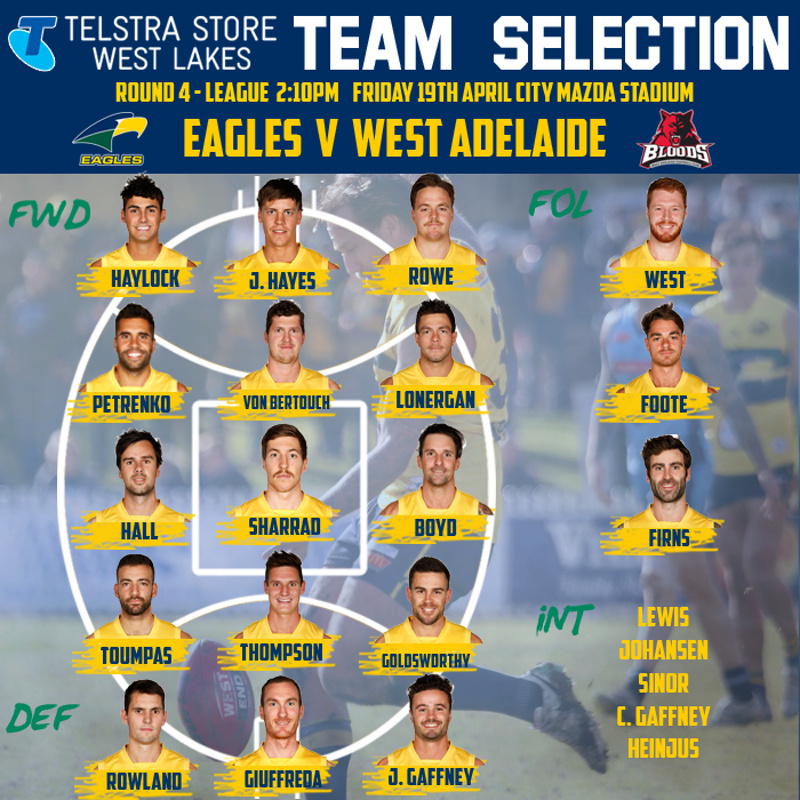 2011 premiership player Jimmy Toumpas will play his first game in the Eagles’ tri-colours since Round 8 2012 after recovering from minor ankle surgery which restricted his pre-season. Toumpas has been joined by co-captain Pat Giuffreda, former Gold Goast Sun Jesse Lonergan, ruckman Jordan West, goalsneak Jake Johansen and running defender Joseph Sinor. 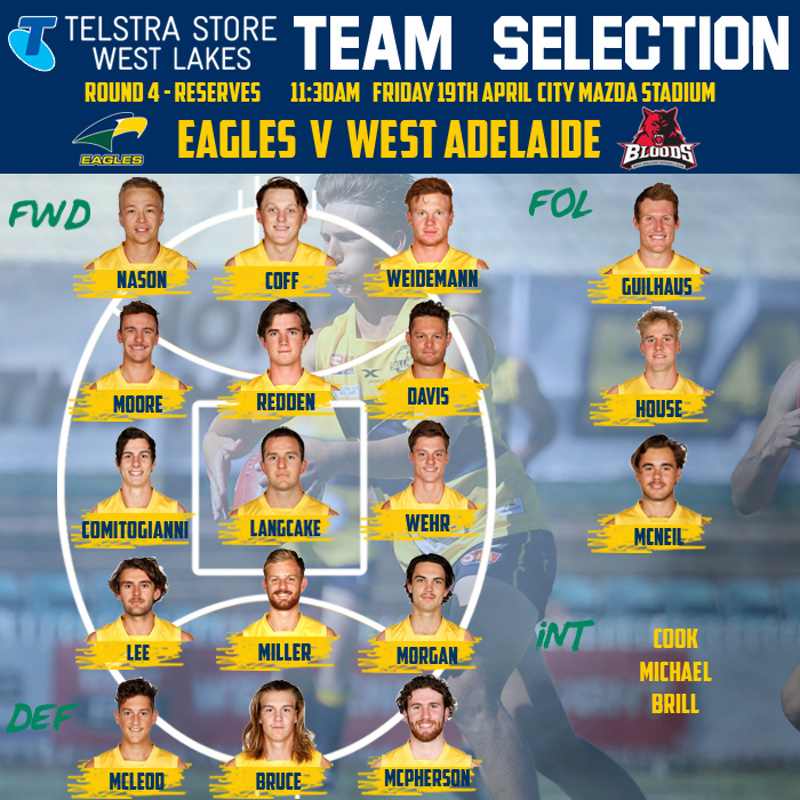 West will replace Jarrad Redden who has a heel problem while Angus Poole (quad) and Jake Westbrook (ankle) have injury complaints. Exciting teenager Kysaiah Pickett has been called up for AFL Academy duty. Comitogianni, Weidemann, Lee, Nason, Cook, E. Miller, X. Redden, Wehr, House, Brill, Bruce, Morgan, Guilhaus, McPherson, Davis, Moore, McLeod, Langcake, McNeil, Coff. 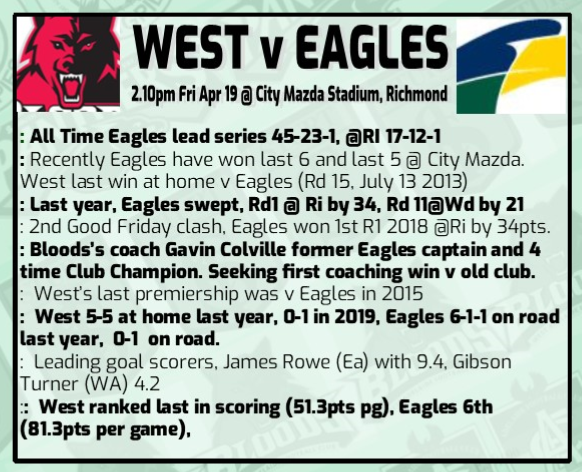 Was a great win by West saw them last week against us and they were awful.Couldnt have predicted that performance where does that put the Eagles at the moment. southern bulldog wrote: Was a great win by West saw them last week against us and they were awful.Couldnt have predicted that performance where does that put the Eagles at the moment. I think it showed that the Eagles need one or two quicker players to complement the team. As we saw with Westies, things can change quickly. best game so far, Beech and Keough were great. Lee wrote: I think it showed that the Eagles need one or two quicker players to complement the team. As we saw with Westies, things can change quickly. From talking to other fans some players have gone past their use by date . Let’s say Rowe was being held onto going for a mark a metre away from Baldie play on ball goes to west’s forward line same tactic west forward being held whistle free kick three umpires two with one set of rules and one with another . Will Snelling's performance was outstanding. 43 touches at a high efficiency, which often meant a West Adelaide clearance. Redden's absence helped West, with Parella doing well. After a poor game at central, suddenly West had 3 marking forwards, Middleton, Keough and Beech (14 marks). The unheralded Murray Waite on a wing gave us pace and line-breaking. Easily his best game for us and he'll keep developing, along with Fairlie, Dunkin & Co.
Josh Ryan was terrific on Hayes, a real old-fashioned, close checking full back. John Noble has to be one of the most under-rated players in the SANFL, was great again yesterday and his pace and work rate was tried in the midfield at times with outstanding success. The Eagles will respond, but may look to change their mix a bit, to inject some more run. Was Seb 17 in the reserves for Eagles if so he cant kick to save his life. I never bag umpires but I swear they tried to keep Eagles in the game. Some decision's for both sides were questionable. Eagles to old to slow. Thiele wrote: Was Seb 17 in the reserves for Eagles if so he cant kick to save his life. I never bag umpires but I swear they tried to keep Eagles in the game. Some decision's for both sides were questionable. Eagles to old to slow.